GREENWOOD, Miss. 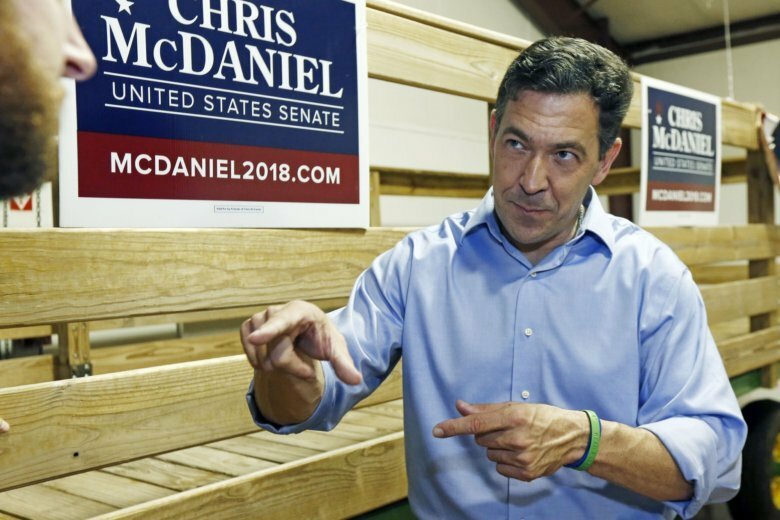 (AP) — Tea party favorite Chris McDaniel nearly dethroned a Mississippi political icon four years ago, never conceding his Republican primary loss to longtime U.S. Sen. Thad Cochran in the state’s most bitterly fought election in a generation. McDaniel is now running again for the same U.S. Senate seat, but with less momentum. He didn’t receive the appointment to temporarily serve in the Senate when Cochran retired in April. His fundraising is lethargic compared to four years ago. In a special election to complete the term that Cochran started, McDaniel lost another coveted prize in this conservative state — an endorsement from President Donald Trump. The appointment, the endorsement and the fundraising advantages all belong to Republican Sen. Cindy Hyde-Smith, and Trump is scheduled to campaign for her Tuesday at a rally in north Mississippi. Gov. Phil Bryant appointed Hyde-Smith to temporarily succeed Cochran and she’s now backed by the U.S. Chamber of Commerce as she, McDaniel and two others compete in a November special election. Hyde-Smith, a cattle rancher, was elected to the state Senate three times as a Democrat before switching parties in late 2010 and winning statewide races for agriculture commissioner in 2011 and 2015. She calls herself a lifelong conservative. McDaniel, an attorney and third-term state senator, still contends that he, not Hyde-Smith, is the president’s true ally. “The people of this state know implicitly that Donald Trump and I are very similar candidates,” McDaniel, 47, told The Associated Press. The Mississippi race could help determine which party controls the Senate. Party labels won’t appear on the ballot, but candidates tell voters their party affiliation, and the other two challenging Hyde-Smith are Democrats. Mike Espy in 1986 became the first African-American since Reconstruction to win one of Mississippi’s U.S. House seats, and in 1993 became President Bill Clinton’s first agriculture secretary. Espy says his campaign recently passed the $1 million fundraising mark. Tobey Bernard Bartee, a former military intelligence officer, is running a low-budget campaign in his first try for public office. If no candidate receives a majority Nov. 6, the top two will advance to a Nov. 27 runoff. McDaniel campaigns at gun shows and relies on Old South imagery. He defended Confederate Gen. Robert E. Lee on Twitter, and his campaign signs have “Chris McDaniel Country” written on the Mississippi flag, which prominently features the Confederate battle emblem. Since Trump endorsed Hyde-Smith, McDaniel has retweeted his own 2014 endorsements from Trump, who was then a celebrity businessman but not yet a presidential candidate. McDaniel says he’s long been fighting the political establishment in Washington and Mississippi. “To the extent that we’re talking about draining the swamp to defend our principles against an establishment that’s out of control, we’ve been doing that for years,” McDaniel said. Cochran served in Washington for a generation and appeared frail during the 2014 campaign. That race grabbed headlines after a McDaniel supporter snuck into a nursing home and photographed Cochran’s wife, Rose, who was bedridden with dementia. Her image appeared briefly in an online video that suggested Cochran was having an affair, which he denied. As Appropriations Committee chairman, the mild-mannered Cochran brought billions of dollars to Mississippi, one of the poorest states in the nation. The spending made him a target of Libertarian-leaning groups, and some spent millions backing McDaniel in 2014. Most of that campaign cash has dried up. McDaniel supporter Suzanne Davis, a homemaker in Tupelo, said she believes Senate Majority Leader Mitch McConnell pressured Trump to endorse Hyde-Smith. Despite diminished campaign contributions, Davis said she believes McDaniel has loyal and organized supporters who want change in Washington. “There’s no way we can outspend the U.S. Chamber of Commerce and some others that Cindy Hyde-Smith has supporting her, but we can outwork them,” Davis said. Hyde-Smith, 59, dismisses McDaniel’s attempt to claim ties to Trump, who won 58 percent of the Mississippi vote in 2016. During a campaign stop in the Mississippi Delta city of Greenwood, surrounded by cotton and corn fields, Hyde-Smith chatted with farmers at a tractor dealership and said the economy is improving because of the president’s policies. The Trump endorsement is important to soybean farmers Larry and Candy Davis. Despite concerns that tariffs imposed by the Trump administration could hurt their business in the short term, the married couple said they support the president and Hyde-Smith. “I’m glad that she and the president get along,” Larry Davis said.